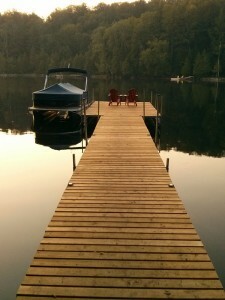 The cottage is in a quiet corner of one of the lakes around Haliburton with a beautiful deck and dock. 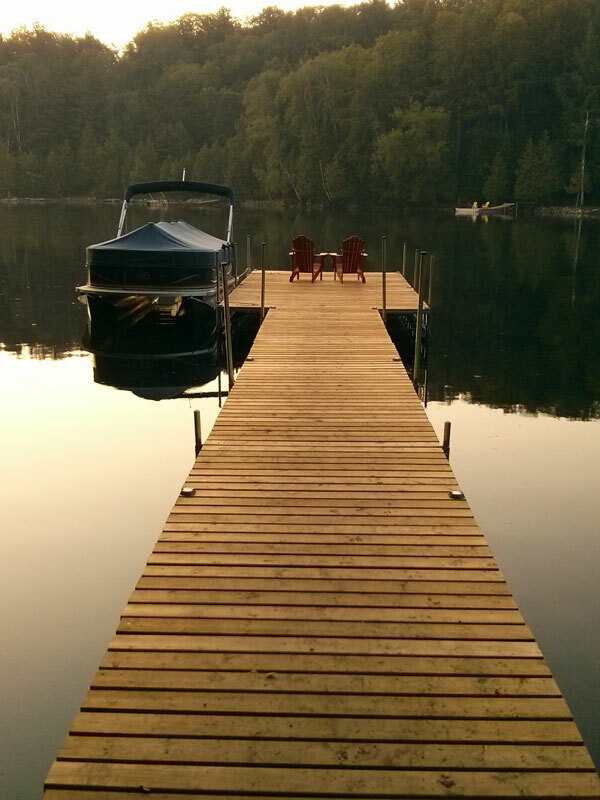 I spent quite some time on the dock, chilling out in the sun, drying up after swimming and searching for snapping turtles and loons in the water. The evenings were full of barbeque smells and loons calling out to us. Marlowe and I promised one another a hike and with a not-so-detailed map we started on one of the nearby trails and hoped to end up relaxing in a small town nearby. The trails twisted and turned, went up and down as we wondered where we were ending up after two hours. We decided to ask for directions and a friendly cottager preparing his boat, laughed quietly. “Uhm… You’re nowhere close to the town” and pointed out we came out of the woods to return to the same lake! 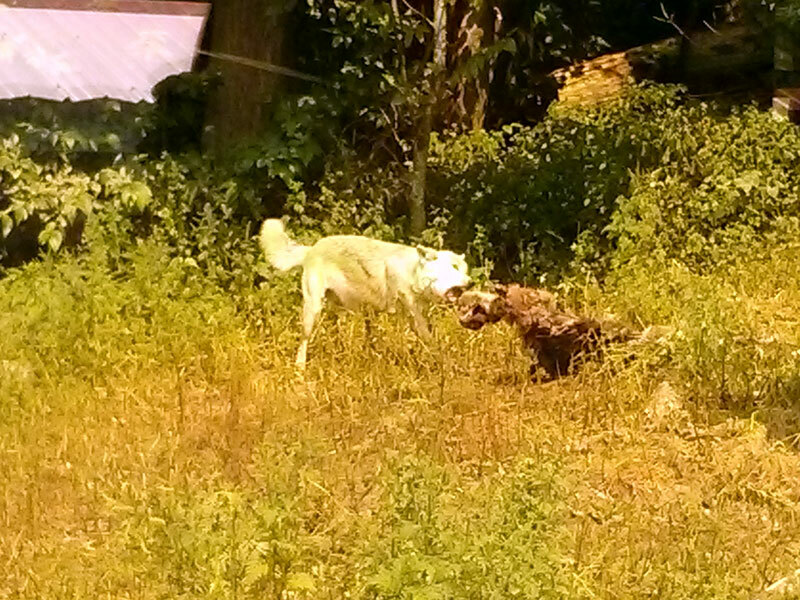 We also visited Haliburton Wolf Centre to learn about wolves and watch them from a viewing room. The centre’s educational and research work is noteworthy and amazing. During lunch at the basecamp Marlowe realized there were literally hundreds of kilometers of forest trails. The rest of the weekend was devoted to planning a hiking trip. My input was minimal with the notion we would need bells. In bear country, it is always best to attach a little bell to your backpack to forewarn bears you’re in their territory. When warned, they’ll stay away. While we were up north we heard about the huskies. Well, that’s a magic word in this family. Within seconds we all excitedly pointed out to each other how keen we were to see the huskies. We went to the kennel and soon found out there were 150 lovely beasts running around here! We were allowed in the girl kennel with 70 beautiful ladies, all eager to get some attention. Of course there was a pecking order and the dominant ones came up first, then the shyer ones came with some coming back for more and more petting. 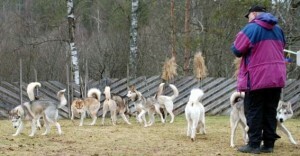 I was surprised to find out there were many kinds of huskies with different colours: gray, black, copper red and white. With the popular pale blue eyes, but we also saw many with brown or green eyes. Some had two different coloured eyes. And some were up for adoption! I would have loved to take one with me right there and then. Unfortunately our housing is not optimal for a husky. Therefore, I want to go out in winter and go dog sledding. Who is coming with me?